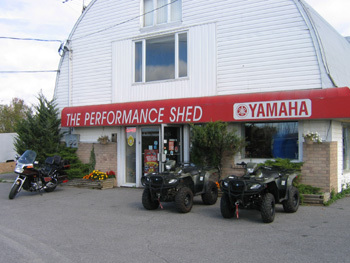 Welcome to The Performance Shed, your full service Yamaha Five Star dealer located just north of Kingston in Harrowsmith, Ontario. Family owned and operated since 1967! Our showroom is filled with an excellent selection of brand new Yamaha ATVs, motorcycles, snowmobiles, generators & pumps, snowblowers, outboards, and more! We also carry pontoon boats, sport boats, fishing boats, and personal watercraft, as well as a selection of pre-owned and trade-in units from Yamaha and other manufacturers. As a Yamaha Five Star dealer you can count on our factory trained technicians to take care of all your service needs. From scheduled maintenance and accessory installations to major repairs and complete rebuilds we’ve got you covered! Doing the work yourself? Our fully stocked parts department and friendly, knowledgeable staff will help you find the parts you need to get the job done right the first time. We also have a great selection of helmets, gloves, and apparel, along with motorcycle, ATV, and marine accessories. Please select from the links on the left for further information. Thanks for stopping by, we hope to hear from you soon!